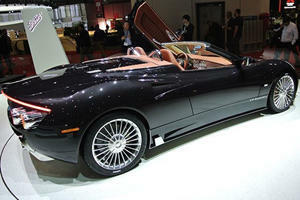 If exclusivity is the name of the game, then the Spyker C8 Preliator is a must-have car. It’s as expensive as it is unique though, and with just 50 units headed for production you can expect a bidding war or two to happen. The aviation-inspired exterior and interior makes for one of the most striking looking cars on the market today, and having a normally aspirated 600 hp Koenigsegg V8 providing the power to the rear wheels via a 6-speed manual transmission, the Preliator has the performance to match the looks. With a starting price tag of $385,000 without taxes and options, you’re pretty much guaranteed to never see one on the road. Holland is known for a few things; windmills, great coffee shops, an abundance of bicycles, and now the Spyker C8 Preliator. With production of the supercar limited to just 50 units, you may well have never heard of one though, and even if you have the chances of ever seeing one in the metal is rather slim. The Preliator is a 2-door mid-engine sportscar from the Dutch automaker and it features design cues inspired by jet propulsion aircraft, highlighting the turbine blade, NACA duct air inlets as well as little wings and ailerons – all to improve aerodynamics. A recent deal with fellow niche automaker Koenigsegg will see all Preliator’s fitted with Swedish metal in the form of a 600 hp V8 engine. 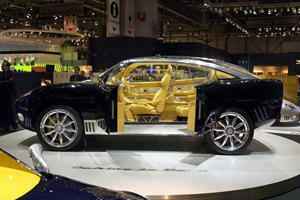 Inside the Spyker C8 Preliator things are a lot more like an art piece than the cabin of a sportscar. It’s quite simplistic in design with all the various controls added to the flat center section of the dashboard, but with the car being inspired by aviation the result of many hours of handcrafting with bespoke items is something more akin to a cockpit of an actual plane. Toggle switches, chrome-bezelled gauges and air vents modeled on turbines are found in the place of the usual modern electronics. The instrument cluster is the same with the most basic of gauges and the leather bound steering wheel is devoid of button and switches – refreshingly so. The main attraction in the 2-seater isn’t the leather bucke? seats, but instead the exposed gear shifter mechanism, again inspired by early aircraft. It’s all very steampunk looking, and that’s not a complaint. With a car that’s as limited as the Spyker C8 Preliator, a true driving impression isn’t possible, but with an all-aluminum space frame and a full carbon fiber body, the torsional rigidity is no doubt be quite high, and combined with a suspension setup from one of the best in the business, Lotus, you’re assured of precision handling. The kinematic-layout suspension includes front and rear stabilizer bars, mono-tube dampers, coil over damper steel springs and an anti-dive and anti-squat setup. The 19-inch Turbofan wheels are shod with wide 295/30 rubber at the rear to afford maximum traction and road holding. Stopping the Preliator is a task left to the AP Racing system and if the car is used on track, unlikely as it may be, carbon ceramic brakes are an option. Servotronic speed-sensitive power assisted steering is in play to make afford the car responsive steering with surgical-like precision. 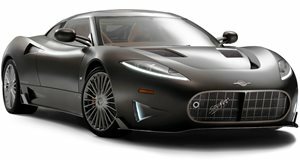 Until March of 2017, the Spyker C8 Preliator was fitted with a supercharged 4.2-liter V8 from Audi that was rated at 518 hp and 443 lb-ft of torque. In this guise the Preliator could hit 62 mph in 3.7-second and had a top speed of 201 mph. Since March the Dutch supercar has been fitted with a normally aspirated Koenigsegg 5.0-liter V8 rated at 600 hp and 442 lb-ft of torque. The change offers the same performance, the only change is the 0-62 mph dash is completed 0.1-seconds quicker. A rear-mounted 6-speed manual transmission is standard fitment making it one of the last manual cars in this segment of the market, but an auto can be optioned. The best of the best is found in the Spyker C8 Preliator, you will struggle to find better quality full grain leather – and it’s available in 15 different colours to make for a personalized interior. For the instrumentation, machined Chronoswiss dials and switches are an option, and quite frankly a must-have to retain that old aviation look and feel. The sound system in the Preliator has been improved and now features connectivity to smart devices via a digital radio that also incorporates Bluetooth and iPhone compatibility. A heads up display is also available if you want a taste of modernity on a fast drive. As far as safety goes, the chassis is the safety cell; a pair of airbags is in play as too is a few passive systems. 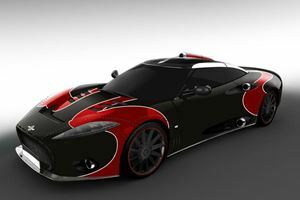 The ultra-exclusive Spyker C8 Preliator is one of those cars that only the wealthiest will be able to afford. There are faster supercars to be had for a lot less money but in that case the car won’t be as exclusive as the Preliator. With many of the exterior and interior styling cues taken from planes of old, the car does have a very unique look, and the exposed shifter that’s the cabin’s focal point will have onlookers talking about it for a long, long time. Having a Koenigsegg V8 engine providing power also adds more bragging rights, and is responsible for blistering performance.